Brighten their day with cookies. Sweet Land of Liberty Chocolate Covered Oreo® Cookies are the perfect treat to share with friends and family in honor of the U.S.A.! An assortment of 12 Oreo® cookies are doused in Belgian Milk Chocolate, White Chocolate or Dark Chocolate to create a taste sensation. 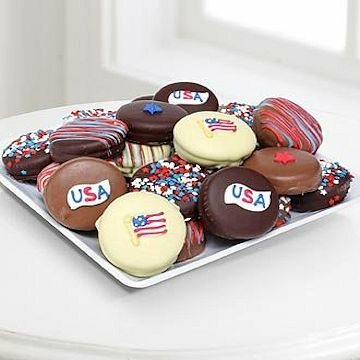 Embellished with flags, red and blue drizzles or "U.S.A.", these chocolate covered Oreo® cookies are a wonderful gift for the 4th of July, Memorial Day, Veteran's Day or anytime y ou want ot say Thank You! .